With Donald TRUMP, who for more than four decades has mastered the art of persuasion, intimidation, and absolute cruelty, words matter. TRUMP’s tactical use of words – finely honed after years of illicit business transactions, an endless string of lawsuits, and the bloviation of his massive ego in Celebrity Apprentice – has enabled him through brute force to seize the Republican nomination: a coup d’état no less. According to the political author Thomas Friedman, in his essay “Trump’s Ambiguous Wink Wink to ‘Second Amendment People’,” this coded use of language is precisely what led to the assassination of Israeli Primi Minister Yitzhak Rabin in 1995. TRUMP may be reckless, but he is not naive, rather, he is calculated and cunning in his seemingly impulsive choice of words. TRUMP is a live performer with an insatiable hunger to rev up his followers into hysteria and even murder. As a demented monologist, TRUMP’s medium is the dangerously transformative use of words. Do not underestimate his ability to choose precisely the right turn of phrase that transmits a coded message under the radar, leaving him (and his surrogates) plenty of room to alter and spin its meaning. In TRUMP’s repertoire, Doublethink is the technique he employs in the “Art of the Deal,” brainwashing his victims into submission, except in this case, he is using his powers of persuasion to undermine the election process. By intentionally confusing the American people, particularly those who are uneducated, unable to defend themselves from Doublethink, least able to differentiate between that which is real and that which is not, TRUMP can feed on them like ripened fruit. 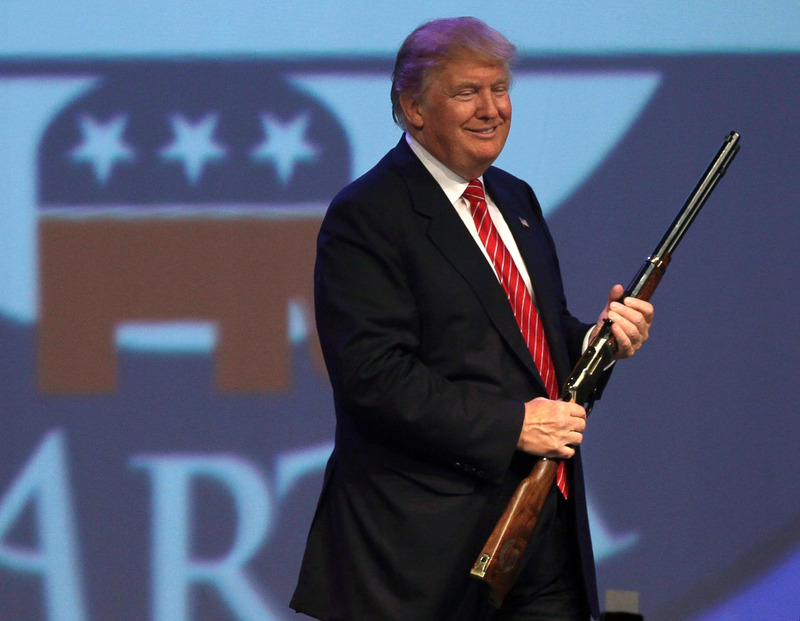 With TRUMP’s mastery of Doublethink, he can boldly claim with the audacity of conviction that his second amendment threat suggests both a call-to-action for a unified political force of democracy, and to those who are ready at a moment’s notice to exercise their constitutional rights and pick up their guns, a license to kill.